Origin of name  Got its name when Brick House burned and it became the oldest dwelling still intact on the island (7, p. 98). William Jenkins acquired the property. William Jenkins constructed a small one-and-a-half story house. 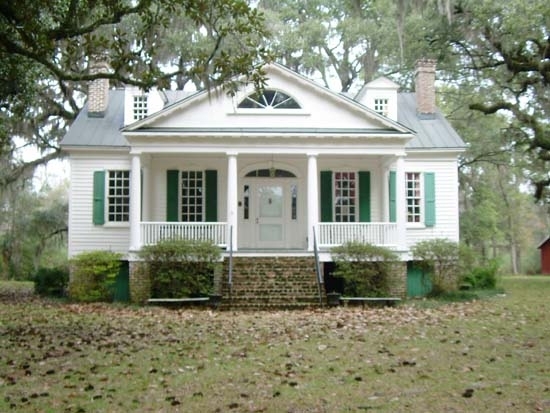 The house is believed to be the oldest house on Edisto Island still in use (1, p. 2) (4, p. 45). Prior to 1775  The Seabrooks acquired the plantation (1, p. 2) (7, p. 98). Early 1800s  Extensive renovations were made by the Seabrooks, mostly to the exterior (1, p. 2) (7, p. 98).
?  The Whaley family acquired the plantation (3, p. 2). 1900s  Modern additions including, an updated kitchen, bathrooms, and central heating and air conditioning, were added to the house (1, p. 3). 1971  Henry W. Frampton owned Old House Plantation. The commissary building was still standing at this time too but was in poor condition. The commissary building was constructed about 1898 to serve not only Old House Plantation but also Oak Island Plantation and Cassina Point Plantation (1, p. 1) (3, p. 1). Margaret von Werssowetz shares that her grandmother, Margaret Rhett Martin, encounter a ghost at Old House Plantation and wrote about it in her book Charleston Ghosts.